Marijuana has become a controversial and divisive topic. We are exposed to all sorts of "facts" and "claims" about both sides of the issue, and our media and popular culture can give us a skewed and uninformed version of this drug. What are the true facts? What does the science say? What do the researchers who have been studying this substance for the last 50 years say? What do our legitimate medical professionals say? ​This page is designed to provide scientific answers to many of the common questions that we get asked about this drug. It is meant to be educational. We include citations to peer-reviewed, academic journals for all of the scientific information provided here so that you can look up the resources and study them for yourself. The questions included here are the most common questions we get asked. We hope this is helpful to you. It's a plant. The technical term is Cannabis Sativa. 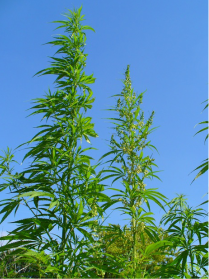 It's a tall, spindly plant that contains more than 500 chemicals, and includes over 100 compounds that are called cannabinoids, (i.e. CBG, CBC, CBD, THC, CBN, CBDL, CBL, CBE, CBT). The two most commonly known compounds in the plant are CBD and THC. CBD (Cannabidiol) - a non psychoactive compound of cannabis. It is the most abundant cannabinoid in the plant, and actually lessens the psychotropic effects of THC. National Academies of Sciences, Engineering, and Medicine. 2017. The health effects of cannabis and cannabinoids: The current state of evidence and recommendations for research. Washington, DC: The National Academies Press. Why is marijuana a schedule-1 drug? In 1971, in Vienna, Austria, the United States joined with other countries in executing an international treaty, entitled the Convention on Psychotropic Substances. It was designed to establish suitable controls over the manufacture, distribution, transfer, and use of certain psychotropic substances. That treaty resulted in the Controlled Substances Act, which gives the authority to control substances to the Attorney General, who has the National Food & Drug Administration (FDA), in consultation with the National Institute on Drug Abuse (NIDA), review, analyze and asses the medical and scientific data to decide which schedule a drug should receive. There are 5 distinct categories or schedules that depend upon the drug’s acceptable medical use and the drug’s abuse or dependency potential. Marijuana is a Schedule-1 drug because: (1) Marijuana currently has no accepted medical use in the United States, (2) Marijuana currently has a lack of accepted safety for use even under medical supervision, and (3) Marijuana has a high potential for abuse, (high likelihood of causing dependence and addiction). "Using established scientific standards that are consistent with that same FDA drug approval process and based on the FDA's scientific and medical evaluation... marijuana will remain a schedule I controlled substance. It does not have a currently accepted medical use in treatment in the United States, there is a lack of accepted safety for its use under medical supervision, and it has a high potential for abuse." 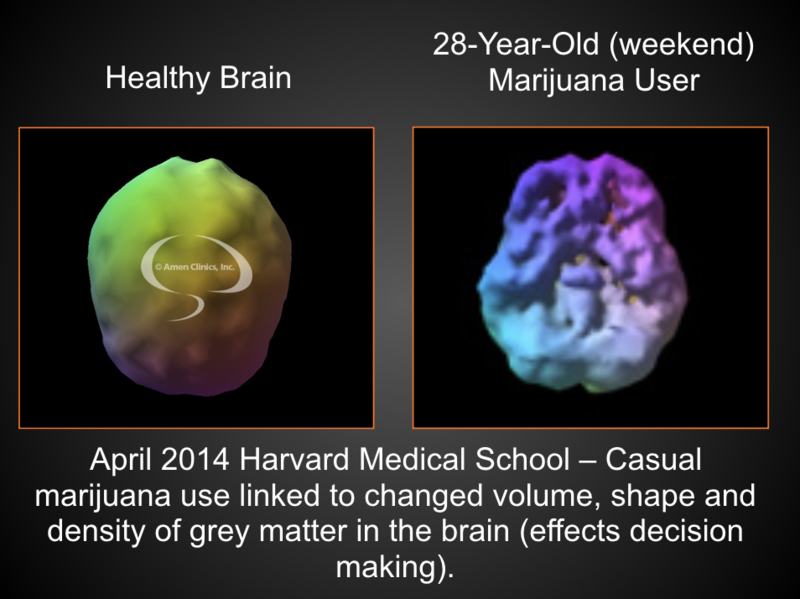 ​HOW DOES MARIJUANA EFFECT THE BRAIN? When marijuana is consumed, the bloodstream carries the chemical throughout the body, impacting the entire system, including the brain. Impacts are both short and long term. 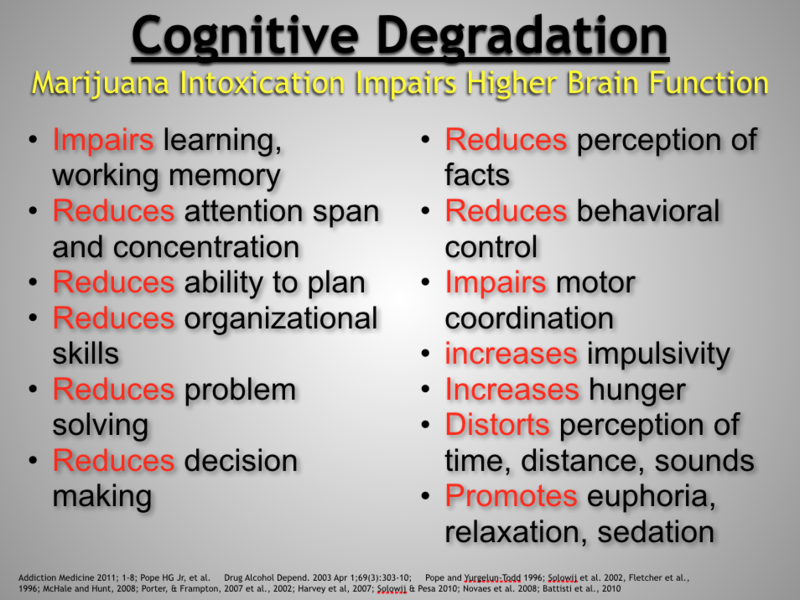 The image to the right includes a list of many of the ways that marijuana impairs higher brain function, including reduced learning, memory, problem solving, decision making, behavioral control, and motor coordination. ​Research shows those who used cannabis heavily in their teens and continued through adulthood showed a permanent drop in IQ of 8 points.4 A loss of 8 IQ points could drop a person of average intelligence into the lowest third of the intelligence range. 1- Volkow ND, Swanson JM, Evins AE, et al. Effects of Cannabis Use on Human Behavior, Including Cognition, Motivation, and Psychosis: A Review. JAMA Psychiatry. February 2016. doi:10.1001/jamapsychiatry.2015.3278. 3- Schweinsburg, A. D., Brown, S. A., & Tapert, S. F. (2008). The Influence of Marijuana Use on Neurocognitive Functioning in Adolescents.Current Drug Abuse Reviews, 1(1), 99-111. It depends on what you mean by "marijuana" and what you mean by "medicine". 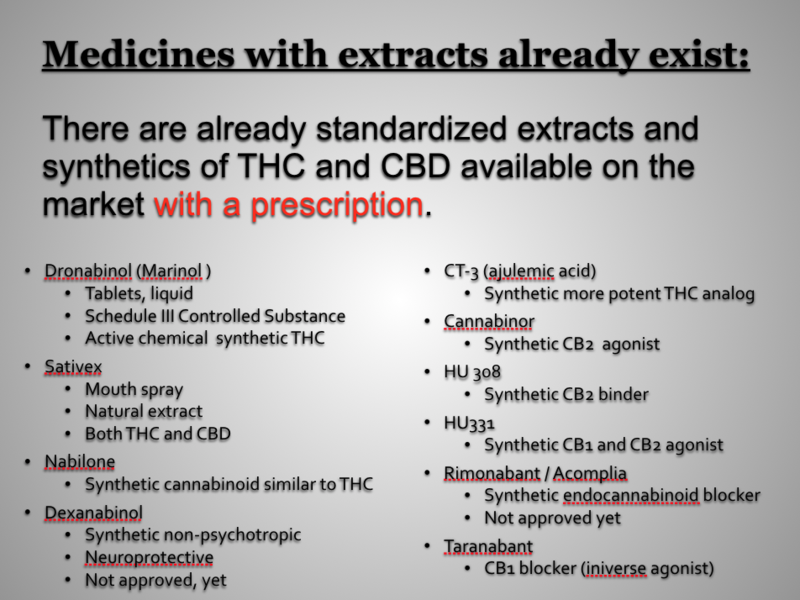 Likewise, we have many medications that are derived from the marijuana plant that are available on the market with a prescription, like Dronabinol (which has THC in it), Sativex, Nabilone, Dexanabinol (which isn’t approved yet,) CT-3, Cannabinor, HU308, HU331, Taranabant, and Rimonabant. Just like aspirin or morphine or any and every other drug that has come into use in the past 50 years, these drugs are tested through clinical trials and approved through the FDA process and then provided to doctors to prescribe with regulations and training on their potency, dosage and prescription schedules. So if the question is, 'do we use the marijuana plant to create medicines, just like other plants that have shown medicinal properties? ', the answer is YES. The AMA has called for more research on the subject, with the caveat that this “should not be viewed as an endorsement of state-based medical cannabis programs, the legalization of marijuana, or that scientific evidence on the therapeutic use of cannabis meets the current standards for a prescription drug product.” Furthermore, AMA believes (1) cannabis is a dangerous drug and as such is a public health concern; (2) sale of cannabis should not be legalized. ​IS RESEARCH BEING DONE ON THE MEDICINAL PROPERTIES OF MARIJUANA? Yes. ​A lot. In fact, during the last two years, the total number of individuals and institutions registered with Drug Enforcement Agency (DEA) to research marijuana, marijuana extracts, derivatives, and tetra-hydro-cannabinols (THC) has more than doubled, from 161 in April, 2014 to 354 in August, 2016. Some of the ongoing research even includes studies of the effects of smoked marijuana on human subjects. The DEA and National Institute on Drug Abuse (NIDA) have also increased the amount of marijuana available for research. Currently, there are 90 researchers registered with the DEA to conduct CBD research on human subjects. They have approved every waiver application that has been submitted by these researchers - to date, a total of 47. ​The DEA say's that: "Currently, NIDA is filling requests for research on marijuana in an average of 25 days. We will continue to work with NIDA to ensure that there is a sufficient supply of marijuana and its derivatives (in terms of quantity and the variety of chemical constituents) to support legitimate research needs. This includes approving additional growers of marijuana to supply researchers." Yes. In fact, more people are receiving treatment for marijuana addiction than any other illicit drug. 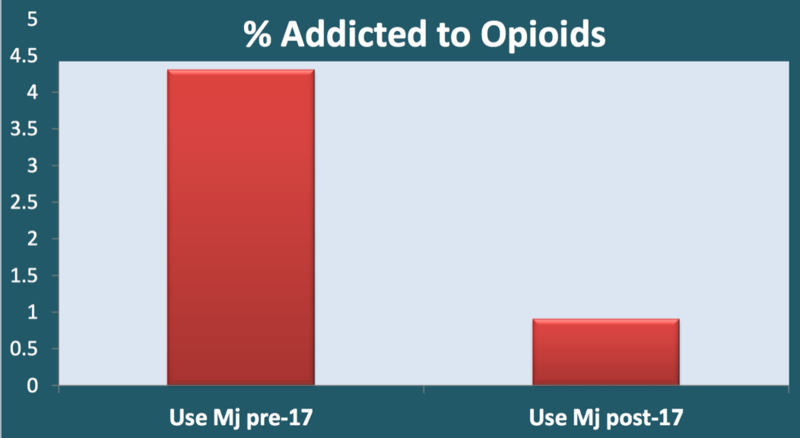 Even in Southern Utah, nearly 40% of people in treatment for substance abuse addiction list marijuana as their primary drug of use, (2015 Treatment Episode Data). Research shows that 1 in 10 adults who use marijuana will become addicted to it, and 1 in 6 adolescents, (Hall, 2015; Wagner & Anthony, 2002). The number of people entering treatment for marijuana addiction is increasing exponentially. 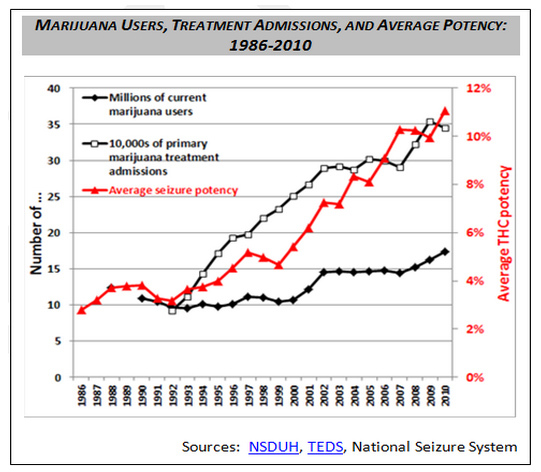 One explanation is the increase in potency of the drug (see chart on the right). Back in the 70's, the average marijuana plant only had about 2% THC (the psychoactive chemical in cannabis). By 2010 THC levels were over 12%, and some reports now show levels higher than 35%. In other words, marijuana today is very different from the marijuana of the 70's, and far more people are facing addiction. Hall, 2015. What has research over the past two decades revealed about the adverse health effects of recreational cannabis use? Addiction. 110(1):19-35. ​DOES LEGALIZING MARIJUANA INCREASE THE NUMBER OF PEOPLE (AND KIDS) WHO USE IT? Yes. 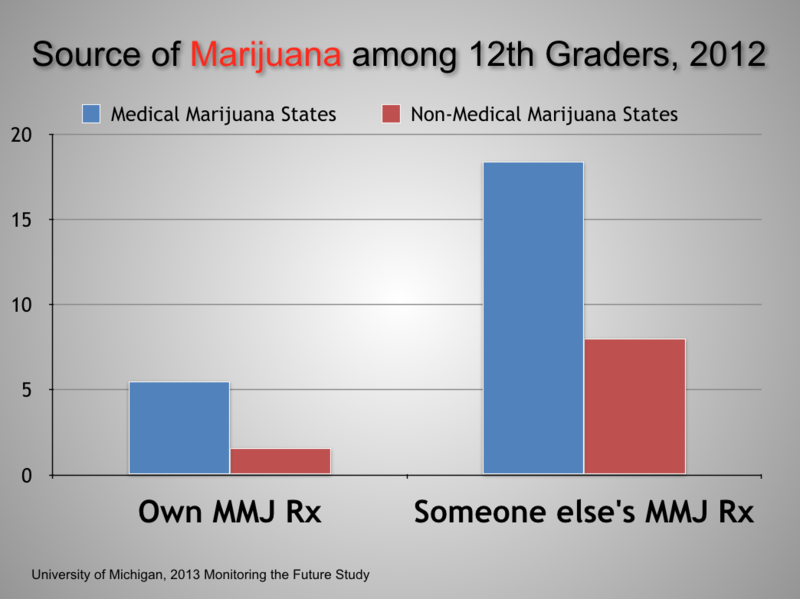 States with "medical marijuana" laws saw an increase in marijuana users not seen in other states, especially with the number of kids who use marijuana, (Substance Abuse and Mental Health Services Administration (SAMHSA), State Estimates from 2008-2009, National Surveys on Drug Use and Health, 2011). ​HAS LEGALIZING INCREASED CERTAIN PROBLEMS IN STATES​? Yes. Use rates are going up. Hospitalizations and overdoses are increasing. 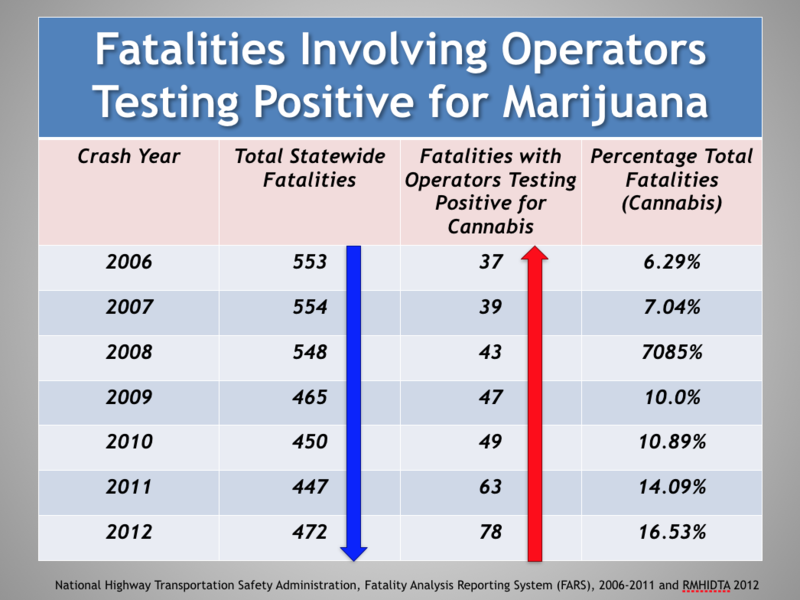 Car crash fatalities and accidents with people high on marijuana are increasing. School and education problems are increasing, and fewer people qualify for job placement because they can't pass a drug test. 374,000 ER visits per year are due solely to marijuana (ER visits for marijuana increased more than 50% from 2004 to 2011 in the US). ​2- Prevention Research Institute, 2016). 3- Asbridge et al. "Acute Cannabis Consumption and Motor Vehicle Collision Risk: Systematic Review of Observational Studies and Meta-Analysis". British Medical Journal, 2012). No. 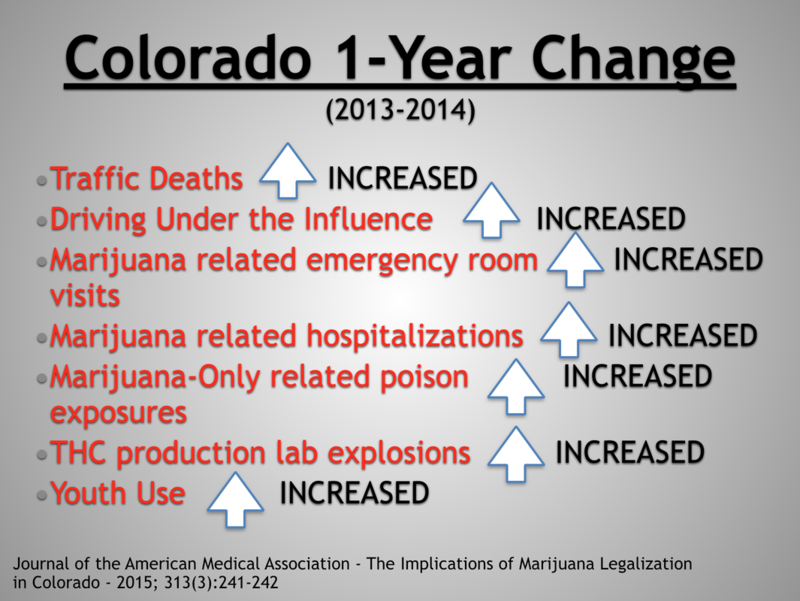 In fact, Colorado research shows that their opioid overdose rates are actually increasing since legalizing marijuana. We already have a problem with people dying from drug overdoses on prescription narcotics, do we really want to make another drug more available for people to overdose on? 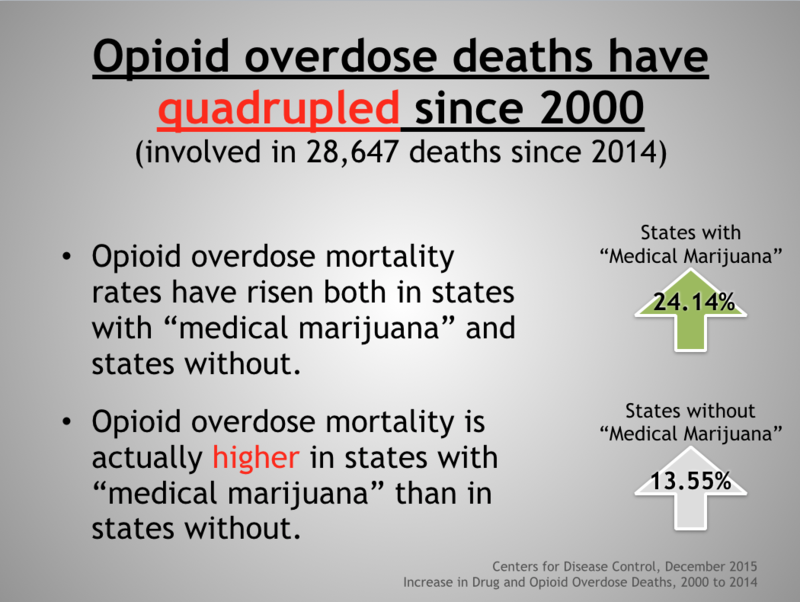 Research from the Centers for Disease Control shows that although opioid overdose deaths have quadrupled since 2000 all across our nation, the increase has been even higher in states with "medical marijuana" laws. 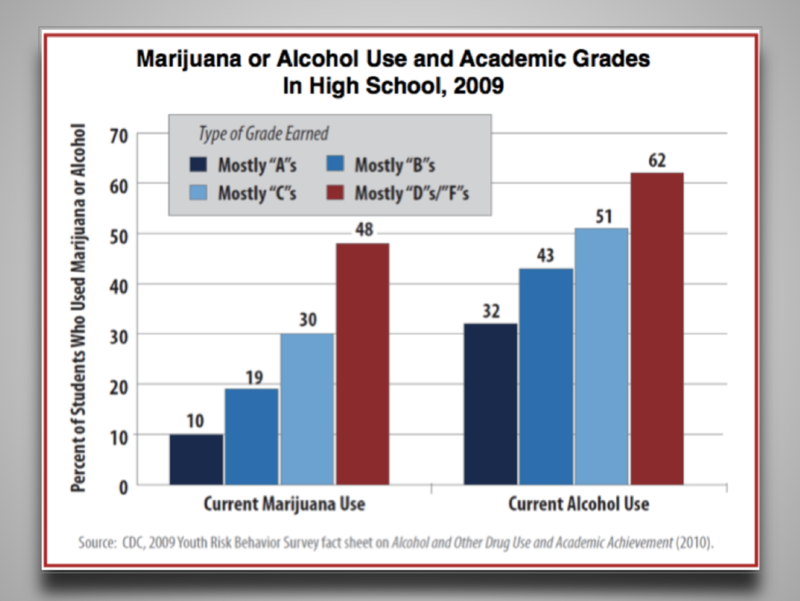 Research also indicates that students with high levels of marijuana use are twice as likely as those without to have an enrollment gap in college, (e.g. dropout and/or failure to graduate on time), (Dr. Arria, MD. Drug Use Patterns and Continuous Enrollment in College: A Logitudinal Study, 2013, vol. 24, Issue 1). 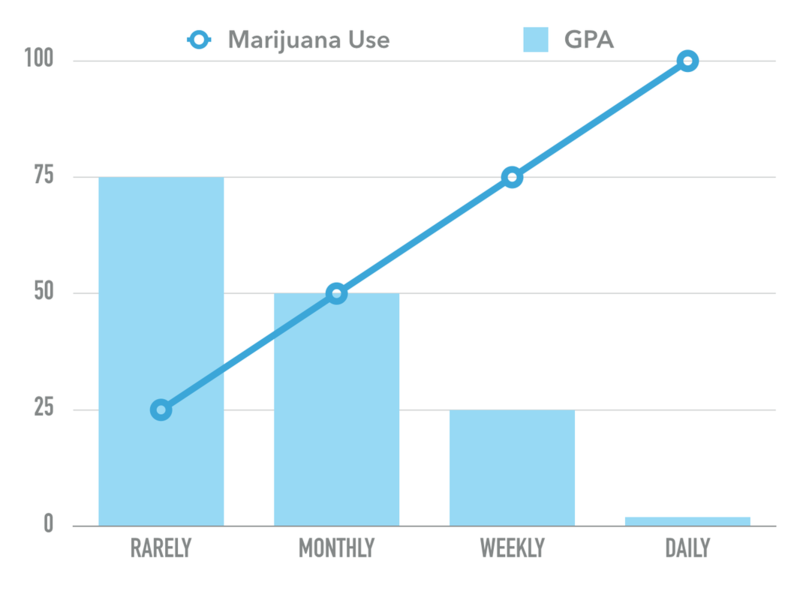 Researchers have also found that how many times marijuana is used directly impacts likelihood to graduate. 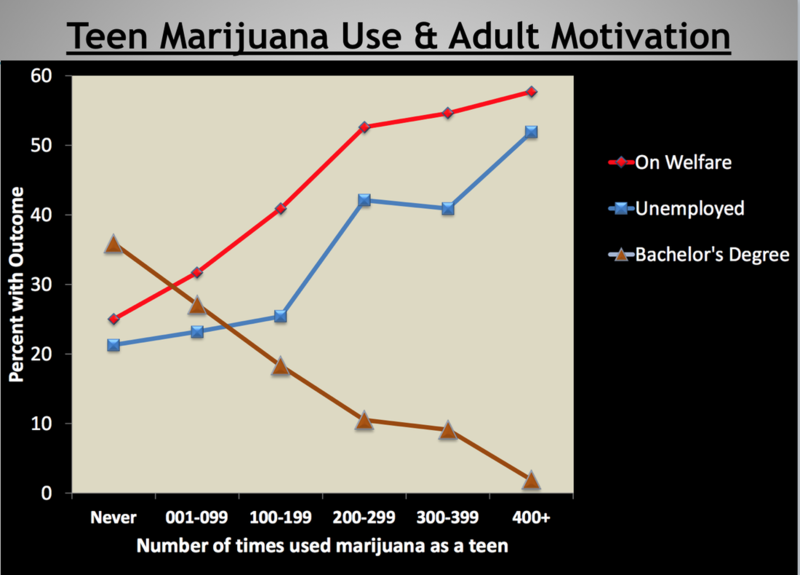 Teens who use marijuana are less likely to get a bachelors degree, more likely to be unemployed, and more likely to be on welfare, and the more times used, the greater the impact. Users also report less life satisfaction as adults, poor career and educational achievement, and demonstrate poorer mental and physical health, (Ferguson & Boden. Addiction, 2008). Yes. People who use marijuana are more likely to use other illegal drugs. 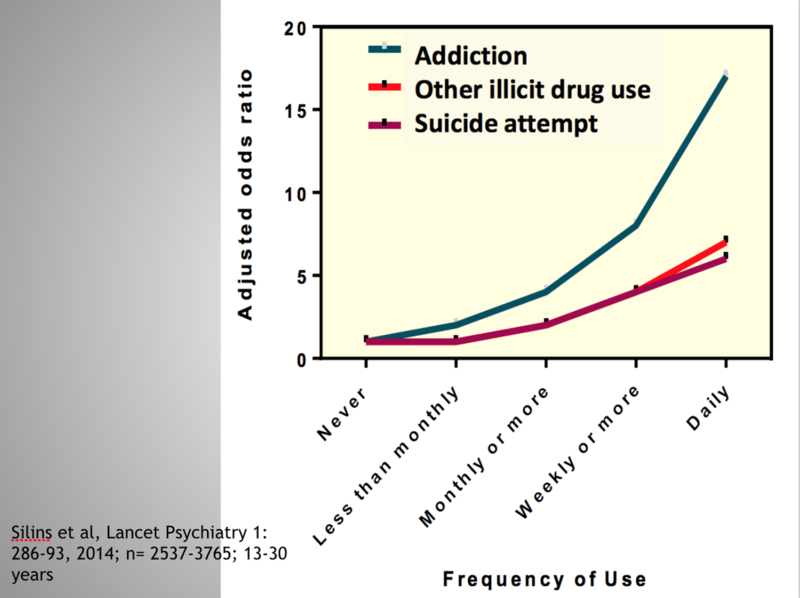 And the more a person uses, the more likely they are to use other drugs, and the more likely they are to be addicted. The researchers who did this study also found that the more someone uses, the more likely they are to attempt suicide. Will legalizing or decriminalizing reduce drug abuse and problems? No. This is a common myth, and the research can be contradictory and confusing, but evidence and experience show that laws impact behavior... that's why we create them. Some people will use no matter what, and some won't, no matter what. But many are influenced by laws and penalties, and laws shape our norms and attitudes about behaviors. Decriminalization means: "the lessening of criminal penalties." It is different from legalization, which is removing all penalties. With decriminalization, penalties are just reduced, and often made civil rather than criminal. In some cases penalties are actually increased, but are civil instead of legal. 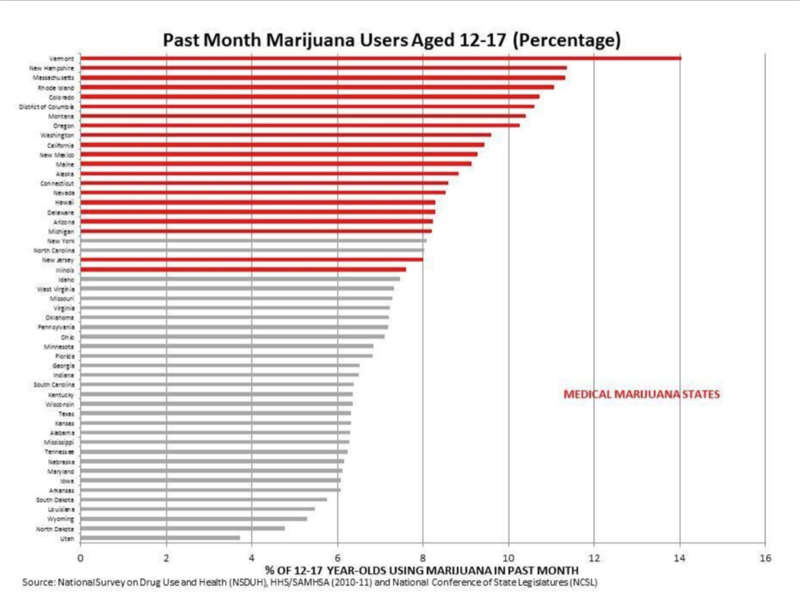 This chart shows that drug use increased for all drugs (and you can see the increase in marijuana use and cocaine use) in the seven years following decriminalization. 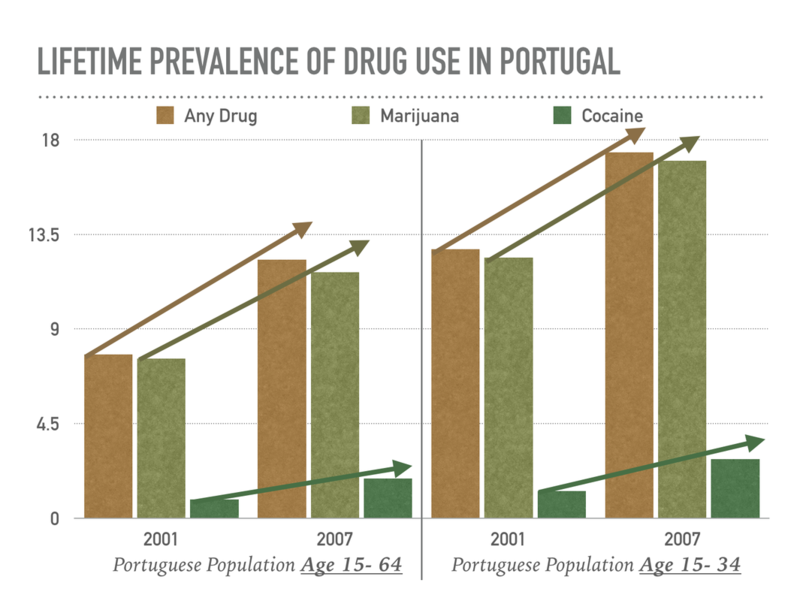 The increase is even greater when just looking at ages 15 - 34, which is the largest demographic of drug users worldwide. See our Marijuana Drug Page.